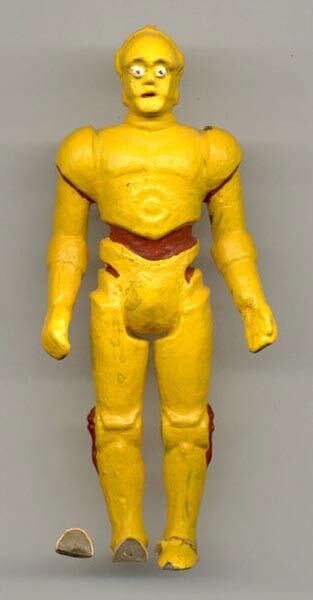 This is a conceptual Droids C-3PO figure. This piece is hand crafted, hand painted, and made entirely of wax. It is hard to say what purpose this piece served since there was already an existing C-3PO figure (which would ulitimately be used). Since there was a fair amount of conceptual work done on the Droids line as a whole I would guess that this was just thrown together with the rest. A piece like this would likely have been used to look at details like color scheme, size comparison, and the overall look and idea of a line as a whole. It was likely a very early presentation piece of some sort. Wax items are exceedingly rare and fragile. This piece has two broken feet, but probably survived because it was never used to make a silicone mold for the production figure. This is a great piece to go along with the conceptual Kea Moll and Sise Fromm figures already featured on the archive.